What if what the Bible says really is true? What if what's recorded in the pages of that book are actually what God wants us to know about humanity, heaven, salvation, redemption, reconciliation, peace, love, sacrifice, etc.? What if what Jesus said in Matthew 25 is true? That those who meet the needs of the least of those in society are actually serving Him as well, and those who aren't meeting their needs, well they aren't and they might as well not even claim to know Jesus nor claim to be His follower. If this is true, then the widow who helped my biological dad when he was drunk, homeless and dying was serving Jesus. And those who stuck by my cousin while he was in prison were serving Jesus. And those who have fed and clothed my friends when they were in need were serving Jesus. And those who didn't, well, they weren't. I love how simple Jesus makes God's commandments in Matthew: 'love God and love others as you love yourselves. Everything hangs on those two things.' What if it's that simple and true? Today took us higher, and I mean higher, into the mountains! We visited several communities in an area that used to have the highest child mortality rate in Central America. Until recently, there was no clean water, sanitation, access to a clinic nor electricity. All that has changed since ENLACE has been working with the local churches and communities in this region. Water is now available (though plans are in the mix for more access), latrines are available for many of the families (though many more are still needed), there is a clinic in the region and even a couple of satellite classrooms for students to attend a school at so they don't have to sit under tin roofs propped up on rickety wooden poles. One of the unintended consequences of being up so high in the mountains was the sun on this pasty Minnesota skin that hasn't seen sun in over 6 months. I can't believe our time here is practically over. It has been amazing to see all the fabulous things that are taking place in this Central American country amidst the seemingly impossible challenges to overcome! The people here are incredibly hardworking and hospitable. After seeing all that transformation that is taking place trough the partnerships of the local churches and communities in the regions ENLACE is working with churches, I am so thankful their goal is to work with a church in each municipality in the country! May it be so! El Salvador, I will see you again soon! 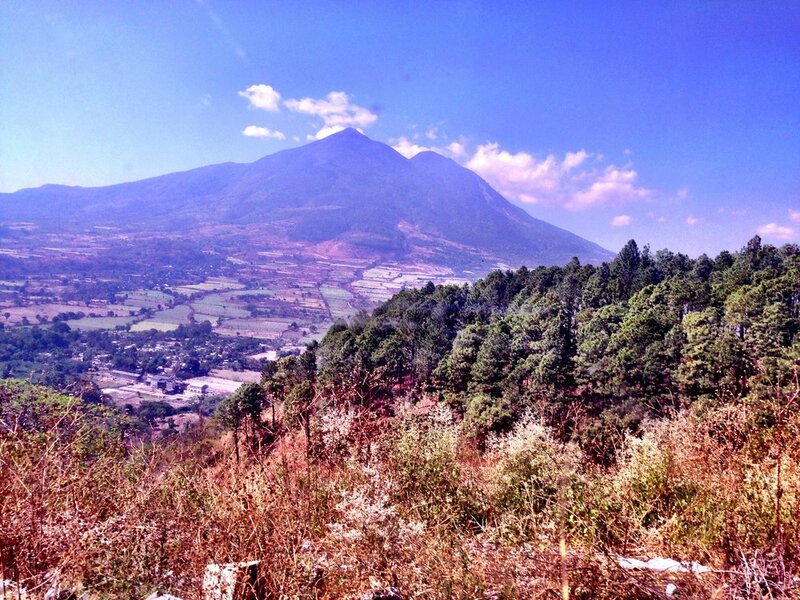 Today, we got to travel to the North Eastern part of El Salvador. It was about a 2 hour can ride through winding mountains, past street vendors and with the local volcano (no worries it's been in active for years) in our sight most of the way. We were able to visit a local clinic that had just been completed this past January and now serves about 16,000 people. Before this clinic had been completed, everyone in the area had to travel to the nearest bigger city and hope that the clinic there even had the medicines they needed. Usually it didn't. Through the partnership between the local church ENLACE has been working with and the local community, the clinic we visited today is constantly well stocked and Sufi isn't for most of the people's usual needs. We then traveled to see a water tank that a local church and community are working diligently on improving. The infrastructure is in place and fully functioning for the water to get to people's homes but the tank is beginning to crack and is too small. As more people have moved into the area, the tank hasn't been able to keep up with the demand for water in the neighborhoods it supplies. So they are hoping and praying that soon they will be able to build a bigger tank and fix the one they have. This will be done more quickly through partnerships with people and churches who can capture the same vision the community has and has a desire to come alongside of what's already happening there through the community's initiative. After visiting with the local water committee, we headed to a community called El Platanar where we had a fabulous lunch if homemade chicken and amazing corn tortillas!! After lunch, we got to hear about how the church we were visiting used to think that they couldn't help people outside the church because they would become 'unholy'. But after working with ENLACE they realized that one of their roles in the community is to meet everyone's needs, not just the Christians. Now they are working with the community to help build a walking bridge that would connect one community to the other. During the dry season people are able to get from one community to the other in 10 minutes. But during the rainy season, the water gets too high in the river bed and people have to walk around which takes about an hour. It was so awesome to hear how this local church is partnering with their community to help make the community better for everyone! Better end here. We're off to dinner in a few! So looking forward to tomorrow!